On a recent trip to the Bahamas Julie photographed some really cute pigs. These are wild pigs that live on an island in the Bahamas, and whenever a boat stops on the beach they come over to check out if there are scraps. They’ll come right to your lens, even if you’re waist deep in water. Julie actually went on this trip, meant to track down Oceanic Whitetip sharks, to photograph these pigs and she got some nice shots. Who needs Oceanic Whitetips when you can photograph small piglets! We had so much fun in the Bahamas diving with Tiger sharks and Dolphins that we decided to go again. 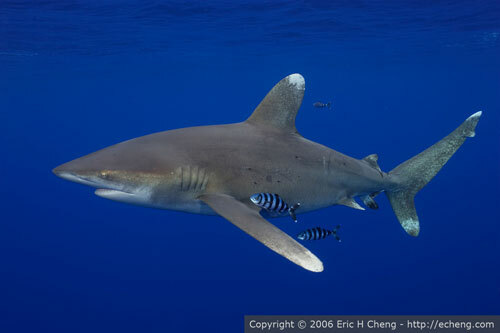 Julie actually decided to go two trips, because she wants to try the Oceanic Whitetips as well. What she really means is that she wants to take photos of the wild pigs they found last year, that would come out to the waters edge so you can take split shots. Not my thing. So for the first time in, well, forever, we’re not going on a dive trip together. I’ll meet up with her for the second trip which is the Tiger Sharks trip. Can’t wait, we had so much fun last time. These Lemon Sharks are always getting in the way of your Tiger Shark shots! In july 2007 we’re going on a trip with Eric Cheng to the Bahamas. 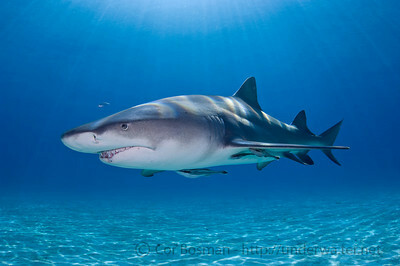 This trip will features Tiger Sharks and Dolphins, two animals that Julie and I have not seen before underwater. We’re really looking forward to it. For more information check out the wetpixel expeditions page. All content copyright Cor Bosman/Julie Edwards | Page loaded in 2.275 seconds.